Gatwick Express is the fastest and only non-stop train between Gatwick Airport and London. The service is designed to take the hassle out of transferring to and from Gatwick Airport. To complement their premium service, they have created a dedicated lounge area for their customers at the Airport. Their contractor, MGMC Ltd, asked us to help them construct three new circular panels to add a softer lighting effect to this area. We supplied double sheets of translucent ceiling panels which were then stretched across modular steel support circular frames and then fixed with cables to the metal beams above. 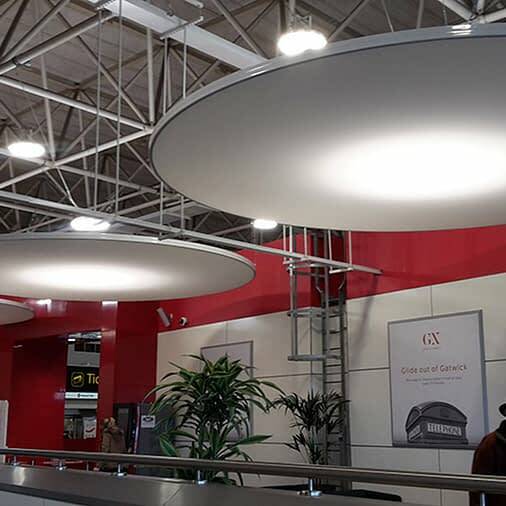 To provide translucent stretch ceiling canvas for three new circular light panels in the Gatwick Express Lounge.